UVic Women in Science presents an interview series highlighting women in the scientific community on Vancouver Island. 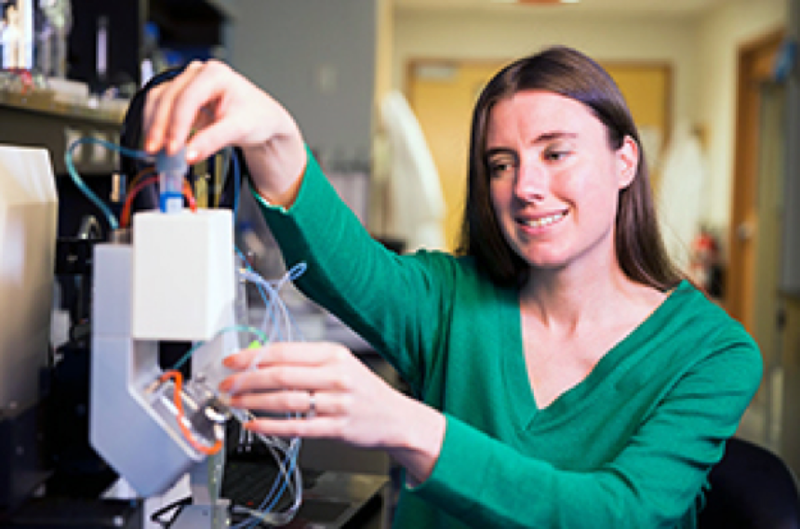 Dr. Stephanie Willerth is an associate professor in the Department of Mechanical Engineering and Biomedical Engineering, as well as the Division of Medical Sciences. Her research group focuses on developing novel tools to address issues in tissue engineering and regenerative medicine, particularly engineering neural tissue using human pluripotent stem cells. She uses bioactive scaffolds and 3D printing with the hopes of one day being able to engineer tissues for transplantation in the human nervous system to treat diseases or repair damaged tissue. What is your field of study and what stage of your education/career are you at? I am currently a Canada Research Chair and Associate professor of biomedical engineering at UVic. My research is specifically focused on biomaterials and tissue engineering. I completed a double major in biology and chemical biology at MIT, followed by a Ph.D. in Biomedical Engineering at Washington University. I then did my post-grad at the University of California, Berkeley in Bioengineering and Chemical engineering. In 2010, I became an assistant professor at UVic in Mechanical Engineering and the Division of Medical Sciences. When did you first become excited about science? I was one of those people who had a really linear career path. I’m famous in my family for one instance in which my 5-year-old Christmas list was a chemistry set and tickets to the Orange Bowl. I ended up getting the chemistry set that year and I did many experiments with it I have also always loved to read. In 8th grade, I won a grant from the local pharmaceutical company which I used to fund my science fair project. How did you get to the position you are in today? Was it a straightforward career trajectory? What are your current career aspirations? I was a straightforward case, as I always knew I wanted to run my own research lab and be a professor. I diversified my education by moving schools with each new degree. I then applied for faculty positions. I was promoted a year early to be an associate professor. I knew what I wanted and I did all the necessary steps to accomplish it. Describe your research focus. My lab engineers neural tissues, as well as some other tissues like muscle. We combine biomaterials, stem cells, and drug delivery to replicate the tissues in the brain and spinal cord. Currently, we have two newer methods for engineering tissues: 3D bioprinting and directly reprogramming somatic cells. We were the first group to print pluripotent stem cells to make neural tissues. The somatic cells we reprogram include skin cells, astrocytes, and even cancer cells. Typically, this process would be done with viral vectors, but you can get mutations in the target cells as well as low transformation efficiency. We use transcription factors instead. At the site of spinal cord injury, you can have a scar made of astrocytes that seals off the healthy tissue and acts as a barrier to regeneration and turn the astrocytes into functional neural cells. Currently, my honours student is 3D printing tumour models and studying how to convert glioblastoma cancer cells into non-differentiating neurons. It is also cool to be the first person on Earth to know something. What do you enjoy about this field/your work? I am particularly interested in stem cells. I did my high school senior thesis on stem cells back when Dolly the sheep was cloned. I enjoy working with students, including undergrads in honours, the co-op program, and those that are volunteering. They are very excited to learn new things and see new data. Another interesting thing I like is learning which cells 3D print really well and which ones don’t. This is dependent on which stage they are at in development. It is also cool to be the first person on Earth to know something. I also like meeting interesting people, which you get to do a lot of as a professor. What have been the obstacles for you during your education/career? Do you believe any of these were specific to being a female? I have had incredibly bad timing in my education. I graduated in 2003 in the USA during the Iraq war when our economy was terrible. Once I entered the job market in 2009, we had the stock market crash. As a result, applying for grad school positions became tough due to the competitive job market. I faced obstacles during the job application process, where I was particularly questioned about family planning. I was also always the youngest and the only woman being interviewed. When I came to UVic, Chemical engineering was very fair in their interview, and they flew my husband up as well which many schools did not do - other schools often see spouses as a liability. Additionally, in some grant reviews, I have seen some evidence of bias but you just have to continue doing what you are doing and hope it all evens out. What do you think about mentorship? Have you had any strong mentors during your career? And do you think it’s an important component of professional development? I definitely think mentorship is important to professional development. My graduate Ph.D. supervisor, Dr. Sakiyama-Elbert, was incredible and is currently the Chair of Biomedical Engineering at the University of Texas at Austin. Within the engineering community, we have a network of women who care for each other. Academia has a lot of informal unwritten rules, and it really helps to have other people see if it is normal. It also helps to have mentors who are not in your specific field. For example, one of my mentors is a friend of mine who is not in academia but is in a leadership position where she faces similar issues to myself in terms of challenges to authority, being the only woman representative in the room, and the pressure to represent yourself in these situations. If I have any advice to give, it is to seek out mentors as soon as possible! A lot of the students in my lab are in biomedical engineering or the sciences and are looking at either medical school or graduate school, so my students get exposed to both what the medical and graduate students do. How do you balance your hectic work/school schedule with your life? What are your interests outside of school? I’m trying to get better at that. I practice yoga and I read a lot. My husband and I love to travel and try new restaurants. I currently have a good scheduling system, although sometimes it is hard to stick to during the semester. Scheduling in and having some downtime during the summer and winter holidays does help though. What has been most challenging about having a demanding career and a family? What would you like young scientists to know about this? The travel can be brutal - interesting, but brutal. I think another thing that comes with being a woman and there being different expectations is that male professors tend to have stay at home wives, and I don’t necessarily have that type of support system. Imposter syndrome (phenomenon) is quite prevalent in female scientists. Is this something you’ve observed during your career? Do you experience it? What do you think we can do to counter it? I do encounter it. I think it comes a lot in a field where women are a minority, as you don’t want to be seen as wrong or not entirely accurate. I’m very careful about what I say and how I present my work. I think that getting more women involved in these positions so that we aren’t a minority would help counter this. When you are the only female present in a professional scenario, it feels as though you are not only representing yourself but the perspectives of your gender as well. A case of imposter syndrome I noticed in myself was when I was writing a book on my subject. When my manuscript was done, I asked the publishers if we should send it to an external person to proofread. They told me I could, but that I could’ve done it on my own because I am the expert on that subject. Another thing I have noticed is that if you look at who applies for jobs, it is often the incompetent or under qualified men, as those who are qualified and competent tend to second-guess or doubt themselves. It is important to have strong mentors who can tell you what you have accomplished and push you to apply for these positions. What has been your greatest accomplishment in your education/career? I’m proud of my research group and all the work we have done. We were the first tissue engineering lab at UVic. I also helped start the Biomedical Engineering (BME) undergraduate program at UVic. What are you still hoping to accomplish? There are a lot of exciting things happening in BC right now. The BC Regmed Initiative (bcregmed.ca) is a network in stem cell therapies and clinical trials and regenerative medicine. We are hoping to see a similar level of support from the government to that in Ontario. There are many new biomedical and biotech companies and incubator activities happening in BC, and we hope to shift the balance to the west coast and away from Toronto. How do you contribute to supporting female scientists that are following in the same path as you? I have a lot of women in my lab that I mentor, as well as having hosted a few events here at UVic. For example, I hosted a talk by Mary Wells, Dean of Engineering at Guelph and former Dean of Outreach at Waterloo, to increase the representation of women in STEM. I’m also involved with Leadership through Diversity (LTD), which aims to increase women and underrepresented minorities, such as those that identify as part of the LGBTQ spectrum, in engineering and give these groups more support. I have also hosted many Girl Guides groups and high schools, providing them with tours of my lab and interviews. What programs/events would you see as being most useful for women in science here at UVic? I would say getting in touch with LTD and Women in Engineering and Computer Science (WECS) to bridge the gap between the sciences and engineering. Other things that would be useful to students would be volunteering with science venture and working in a lab. The Centre for Biomedical research also has a lot of training activities. What advice would you give to students and young females interested in science? I definitely say work in a lab and get lab experience. Try working in many different labs and get different experiences by becoming exposed to a wide variety of things. For those in high school - take physics! Not taking physics in high school is one of, if not the main reason, so few women go into engineering. If you want true diversity, you need a diverse population of different genders and ethnicities. Having a diverse group of people allows unique ideas to surface that otherwise wouldn’t necessarily be thought of.